Confession: I don't always wear makeup on the weekends. Though I love a polished look, I am certainly comfortable going out without a stitch of makeup on my face. So often on the weekends, you can find me running errands about town in nothing but lip balm (and SPF, day cream, serum and eye treatment - skincare is ALWAYS a must). But this past weekend I felt like wearing makeup because I like to live life on the edge. I grabbed a few of my favorite items for an easy, but finished look. Urban Decay Naked Skin Foundation is one of my all time favorite foundations for it's flawless finish and ability to wear forever. No primer or concealer (though if I did, this one and this one are two of my staples) with this look because I wanted it to be quick and easy. 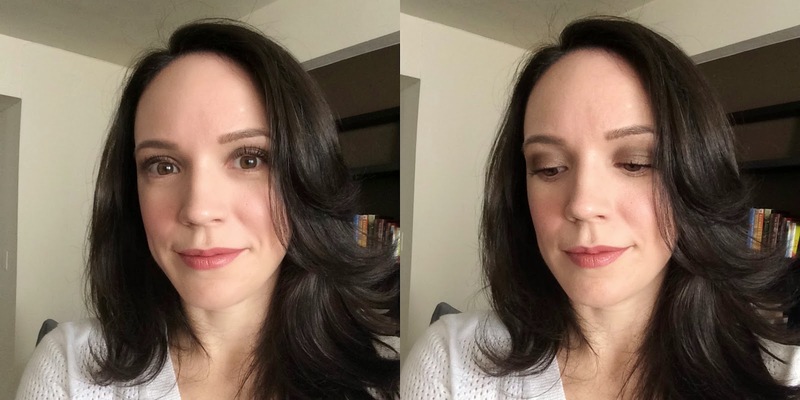 My Hourglass Arch Brow Sculpting Pencil in Soft Brunette is always in rotation (I alternate it with this other favorite), and the Urban Decay primer potion is something I never do my eye makeup without. I mixed the two shades Suspect and Pistol from the Naked 2 palette together on the lids to create a subtle smoky effect. A few coats of Estee Lauder Sumptuous Extreme Mascara gives me 'wow' lashes, and even though it was the weekend, I feel dramatic lashes are suitable for any occasion. I dusted the Bobbi Brown Brightening Powder along my cheeks and hairline, and then the NARS Outlaw blush on the apples of my cheeks. I was not a fan of this blush when I first saw it in the pan, but a friend convinced me to buy it and I'm so glad I did. It is one of the best blushes for giving a subtle rosy flush. Finally, Marc Jacob's lip color in Roleplay was quite the sleeper hit when purchased. I figured I would like it and use it occasionally but did not expect it to emerge as one of my favorite lip colors of all time. I'm not sure weekend makeup will always be a regular thing for me, but it's nice to do every now and then. Have you entered my glowing skin giveaway???!!!! Well you need to. Enter here. Gorgeous look!! I have to try that Naked palette. You look lovely :) So glad I found your blog through Insta!